_MAL3536.jpg, originally uploaded by Michael A. Lowry. I met Daniela around 17.15 for a bit of climbing at Klättercentret tonight. We climbed four or five routes before Daniela left to see the new Pirates of the Caribbean film. I had a chocolate muffin and a cup of coffe and then resumed climbing when Matt & Lisa showed up. Paula and I climbed a few more routes and I managed to do a bit of bouldering, but mostly I tried to take it easy. My plan was to save my strength for tomorrow's boulder open competition at Karbin. I don't know if I stuck to the plan. I climbed a few routes that were pretty demanding on the ole' forearms. I guess we'll see tomorrow. I'm looking forward to the competition. Tonight I actually brought my big f/2.8 70-200 mm lens with me, and was able to get some photos that woud be hard to capture with another lens. It's nice to have this lens every once in a while, but damn it's heavy. In this photo, a new climbing friend named Emma climbs a fun route up the tall wall. 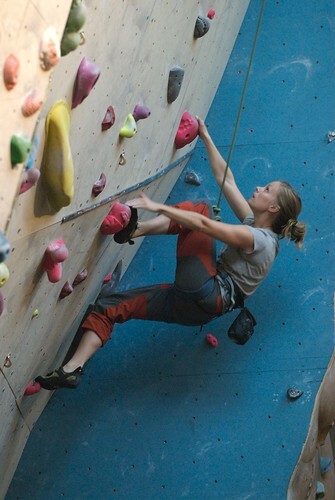 She also conquered the route of black-colored grips in the corner there — that one is so much fun! Enjoy the best 35 photos from tonights climbing!